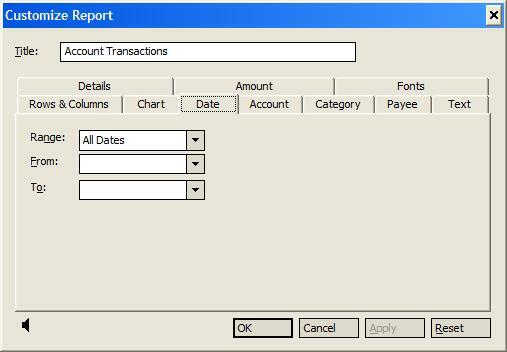 Create an account transaction report using the procedure that applies to your version of Microsoft Money. 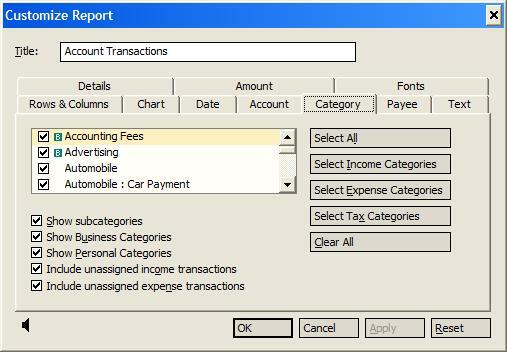 In the Income and expenses area, select Account transactions. 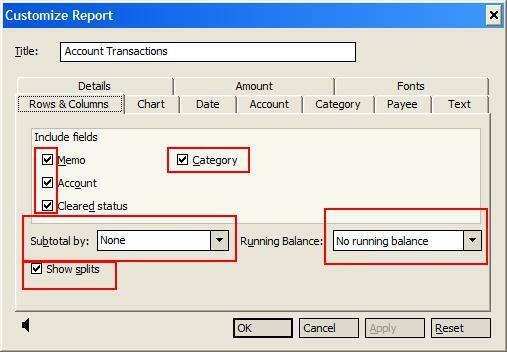 If the Account transactions report is not in the list, display the advanced reports by selecting Change report settings in the Other tasks list. 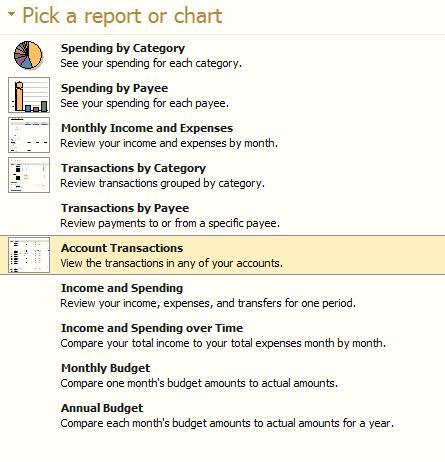 Select Switch from Essential Reports to Advanced Reports and click Use Advanced Reports to display the Account transaction option. Select "All Accounts" and "All Dates" at the bottom of the screen. Select the Reports menu and select Reports Gallery. 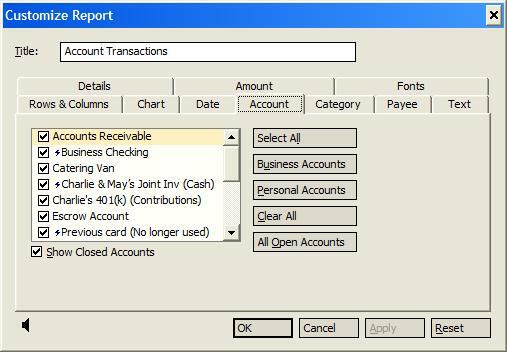 In the Pick a report or chart list, select Account Transactions. Click the Go to Report/Chart button. In the Common tasks list, select Customize. If the Reset button is not available, proceed to step 3. Otherwise, click Reset. If a confirmation message appears, click Yes, and select Customize again. 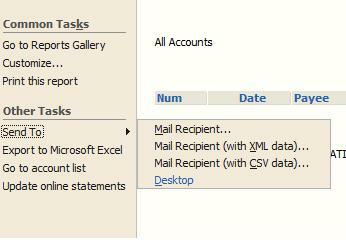 In the Rows & Columns tab, in the Include fields area, select the Memo, Account, Cleared status, and Category options. In the Subtotal by field, select None. Select the Show splits checkbox, and then click OK. In the Accounts field, select All Accounts. In the Date range field, select All dates. In the Category field, select All Categories. 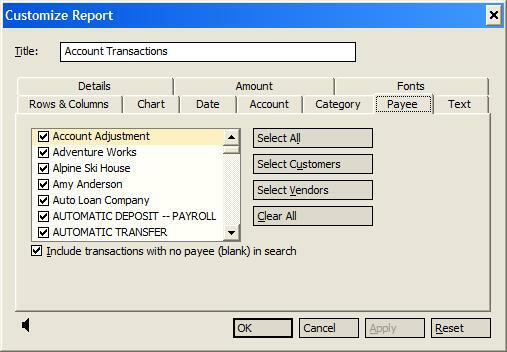 In the Payee field, select All Payees. Select the Send to menu and select Desktop. This step might take some time, depending on the size of your data file. Open MyMoney, select File-Import-Import Microsoft Money. Review your transactions for accuracy. Reconcile your converted data before adding new data (the Data Converter does not retain the reconciliation state of your accounts). 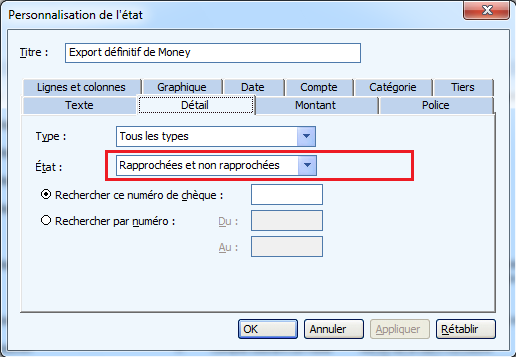 Don't forget to delete the Microsoft Money reports from your desktop by right-clicking the reports and selecting Delete. Empty your recycle bin by double-clicking the Recycle Bin icon on your desktop and selecting Empty Recycle Bin. If File-Import options is missing in MY Money it means that you don't have an opened database to import your data into. Please start a new File first, using File - New - New File. Please place it into a location that you will remember later on, for example Documents/Financials. 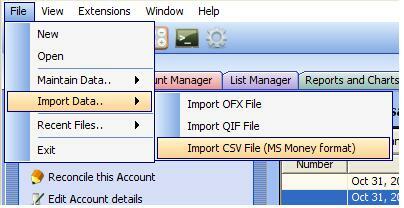 My Money is very sensitive to the CSV file format generated, it has to be just right for the import to go through. Also, please make a note of a date, in this example the date is 9/19/06, or September 19th, 2006. For example, if your dates are 2006-19-09 please change the format to yyyy-MM-dd and re-import your data again. Once the transactions are imported to your liking we suggest to start a new brand new database and import transactions there if you had previous issues with the dates or reconciliation statuses. Please note that imports are very CPU intensive operations so it may take a little while for the process to finish. After a successful import operation please switch to the Account Manager tab, your imported accounts and balances should appear there. If you mark any of the accounts as favorites they will also appear in the chart of accounts on the Transaction Register tab. Under certain circumstances reconciled transactions could be missing from a Microsoft Money generated CSV file. Microsoft generates CSV files to be US-ASCII Character set compatible, which means that some characters can disappear of get corrupted. For example à could be replaced by ‡, é by È, etc. Once CSV is generated with corrupt characters they will get transferred into My Money verbatim. The easiest way to address this is to open CSV file in a text editor before the conversion and search and replace for the corrupt characters. You will need to save the CSV back into an encoding that support extended characters set, for example UNICODE encoding.